This book was written by me because I felt it was urgent to educate people about what I was able to learn about the Oil-Protein Diet by Dr Budwig. After the death of Dr Budwig in 2003, a dynamic developed, which I consider was very negative. Since her death, around the world numerous experts came forward, writing books about the Oil-Protein Diet, publishing new recipes and inventing supposedly improved food variants of the Oil-Protein Diet. There are even some who dare to lecture and hold seminars about the Oil-Protein Diet. They hold views which are a far way off from what Dr Budwig had written or said. Maybe you might think that it’s a little strange that I write right at the beginning of things that at first glance have nothing to do with the actual “Oil-Protein Diet.” However, you will understand the importance of it all if you read a few things about the Oil-Protein Diet on the Internet and realize that this significantly differs from what Dr Budwig or I re- present. To help you understand this and to assess this properly, I just wrote down what happened since the death of Dr Budwig. At DrBudwig’s funeral, I met the legal heirs; nephews Arno and Armin Grunewald personally for the first time. Several months after the death of Dr Budwig, both contacted me. With 80% and 20% respectively they are her legal heirs. They told me that, in recent years, I was the only one who had worked intensively with the Oil-Protein Diet and concurrently was the only one representing this diet in Germany as well as around the world publicly. And since I also was the only man whom her aunt ever accepted as a student and with whom she ever wanted to write a book (Cancer – the Problem and the Solution), I would be the right man to establish the Johanna-Budwig Foundation jointly. Initially, I thought that to be a great idea. Subsequently, the Grunewald brothers, my wife, and I had several meetings to discuss the structure of the foundation. However, it was quickly discovered that our goals were entirely different. My aim was to pass on the oncological legacy of the Oil-Protein Diet exactly as I learned it from Dr Budwig for the benefit of cancer patients many years ago. But mainly Armin Grunewald held the opinion that the Oil-Protein Diet was no nutritional therapy for cancer patients. Nonetheless it came to a legal dispute stretching over several years. However, in the end, the court decided in my favour on the grounds that I wrote the book jointly with Dr Budwig and also owned a joint copyright on the book “Cancer – the Problem and the Solution”. Therefore, all rights on this book are only available to me and not the legal heirs. The complete contents of the book the “Oil- Protein Diet Cookbook” belong jointly to the legal heirs and me. much more important to me than the rights to the book “Cancer – Problem and Solution”. 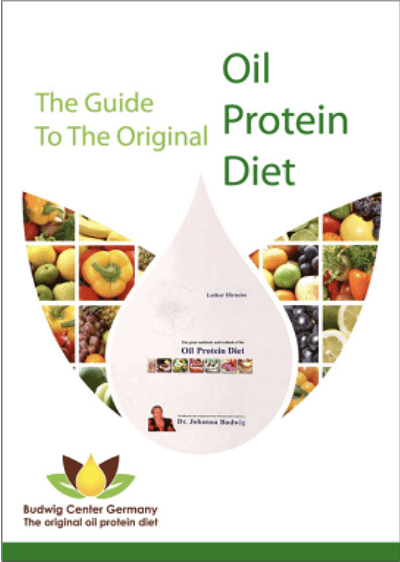 The book the Oil-Protein Diet Cookbook includes all the basic recipes for this diet. If it got in the hands of the legal heirs, the content might have been distorted in a way that the Oil-Protein Diet was no longer available in its original format in the future. It was more important to me to remain in possession of the rights to the Oil-Protein Diet, even if it means I have to share this with the legal heirs. preserves the legacy of Dr Budwig and develops the same, as it is written in the statutes. Instead, it is reported via TKTL1 and thereby also in detours via Dr. Coy and his TAVAR- LIN therapy. Dr Budwig would inevitably wallow in her grave if she knew that a foundation bearing her name advertises cocoa biscuits, nut cake, and strawberry jam. Truthfully, from a foundation bearing the name of Dr Johanna Bud- wig, almost everybody would expect something different – and, in particular, Dr Budwig. According to the Foundation, therefore, the Oil-Protein Diet is no medical cancer treatment, but, under certain circumstances, can support a medical cancer therapy. Unfortunately, this does not say, what the Foundation understands under the term “medical cancer therapies”. Evidently, the Oil-Protein Diet, according to the Dr Budwig- Foundation does not belong to this medical cancer treatment. Wow, is all I can write. To my knowledge, almost all patients of Dr Bud- wig were cancer patients. Although I was able to view a few patient files of depression, epilepsy or multiple sclerosis, I would say that roughly, at least 98% of all of DrBudwig’s patients came to her with a cancer diagnosis. This was what she was known for. In addition, Dr Budwig has written extensively about what cancer is and how you can treat cancer with the Oil-Protein Diet in almost all her books and articles. For more than 50 years, cancer dictated her life. And likewise almost all our conversations were on the subject of cancer. If Armin Grunewald now insists that there is no healing effect proven regarding the Oil-Protein Diet in cancer patients, what would that mean? That 50 years of DrBudwig’s work were entirely useless? Unsuccessful? Without any effect or what were they actually? I knew from our personal conversations that Armin Grunewald, which I called: “Had his problem with his aunt and the Oil-Protein Diet”, but that he believes the Oil-Protein Diet has no curative effect on cancer at all, shocked me when I had to read this for the first time. “Of course you can also eat meat three to four times per week if you like it. The main goal is the continuous supply of the body with Omega-3 fatty acids”. Or: “You may eat eggs”. Or: ““You are welcome to join us for the frying of meat with Oleolux”. It is certainly no secret that Dr Budwig didn’t have a single recipe with meat or eggs in her standard work on the Oil-Protein Diet and almost her entire life was devoted to fighting against margarine. So who-ever wrote such sentences, has a completely different understanding of the Oil-Protein Diet than Dr Budwig or myself. I ask for you to understand that I am writing here so much about Armin Grunewald, because I think it’s very important because many people, especially in Germany and in the United States, still believe that he would be the successor of Dr Budwig, but instead he has promoted a form of nutrition that has very little in common with the Oil-Protein Diet created by Dr. Johanna Budwig. I’ve not known that Dr Budwig ever might have worked on anything during her lifetime with her nephew regarding the Oil-Protein Diet. No joint seminars, no common lectures, no common books, etc. How important the above can be, I would like to show you an example. If you have not properly understood DrBudwig’s words or total system or believe everything published on the “scientific studies” today named above about Omega-3 fatty acids, then, of course, you will also not understand why eggs in the Oil-Protein Diet are so negative. When looking at eggs neutrally, they have the highest biological quality protein that you can eat as a human being and contain a lot of cysteine. So they should be a perfect food for the Oil-Protein Diet. And now an “officially recognized Oil-Protein Diet expert” explains that these facts have been discovered only a few years ago and Dr Budwig couldn’t know this. Then are you sure that you would not believe this and would incorporate eggs into your Oil-Protein Diet? Or “modern margarine”, or “modern glucose-free jam”, or “modern??”! Unfortunately, Dr Budwig has been dead since 2003 and can no longer fight against all this nonsense. She would explain to you otherwise, what negative impact eggs have on the blood pH and that they would abolish the effect of the Sauerkraut juice which is very important in the Oil-Protein Diet. Or that simply there can be no “modern margarine”, because you cannot produce margarine without completely changing the spatial structure, so that every gram of margarine alters the cell mem- brane negatively. Or that “glucose-free jam”… But I think you under- stand what I mean now. You can see from the example with the eggs, how important it is that you don’t just change things, just because “experts” write it or incredibly scientifically explain it. If someone was an expert in the Oil-Protein Diet, then it would be Dr Budwig. Therefore, that is why I stick to her words and what I personally could learn from her. And it is now fact that the Oil-Protein Diet is an excellent nutritional therapy for cancer patients and that neither meat nor eggs, and certainly not margarine, are compatible with this diet. Following the Oil-Protein Diet is not always easy, as, it needs to be consistently carried out as a nutritional therapy. Hence if you are going to do the Oil-Protein Diet or another diet such as such as Gerson, macrobiotic or raw food, then I strongly recommend you to stick with what the inventors of that particular therapy have written. I’ve written this book to bring you closer and to give you the ingenuity and the simplicity of the Oil-Protein Diet. No Latin words or complicated explanations, and only the original Oil-Protein Diet by Dr Budwig, because I want to help you to get better or stay healthy. I had the unlikely good fortune, to personally convince myself of the success of the Oil-Protein Diet and I do not just think that it can help; I know that it will certainly do so. But this is only possible if you really follow DrBudwig’s Oil-Protein Diet and not any pseudo fare. Adhere to the recommendations in this book or to the original writings of Dr Budwig even if they are not always easy to understand. Why should you ever follow a “more modern Oil-Protein Diet” at all? Whatever promise these “new experts” give to you, or no matter how wise they are, they enormously differ on one point from the Oil- Protein Diet, by Dr Budwig – and that is in the success. And that is what you are going for right? You’re certainly not concerned, who is right now in the University questioning whether you may or may not eat eggs in the Oil-Protein Diet. You are certainly not concerned about being the first human being presence of electron clouds in a simple diagnostic procedure to be able to prove this. The question that is more important to you is: How successful was and is that Oil-Protein Diet, and can it help you with the challenges of your life or not? Dr Budwig and her Oil-Protein Diet have proven to help many people, and the emphasis here is based on proven data. Here it differs significantly from many others. Because Dr Budwig has proven that her nutritional therapy helps cancer patients and even often those in a hopeless stage. Dr Budwig no longer has to prove her theories, in contrast to all these other people. And allow me to point out the 3E-Study (see the appendix in this book) which I initiated. The basic therapy of the patients in this study was the Oil-Protein Diet. help other people. On the other hand, there are wonderful people who are very grateful to people like Dr Budwig or my person that dare to say all these things. And then there are still great collaborators all over the world that employ a lot of life energy to support the Oil-Protein Diet. I have “Oil-Protein Diet buddies” in many countries and everywhere people deal with DrBudwig’s legacy; sometimes I’m even surprised when people in countries such as China, Vietnam, India, Kenya and Russia tell me about their successes. But in Europe you can also see the success. There have never been so many companies that sell flaxseed oil in Germany like in the 21st century and in Europe alone, there are 10 companies that use the name Budwig. There are several authors who write about flaxseed oil and in popular cooking shows, the words Oil-Protein Diet fall from time to time. Unfortunately, the growing popularity of the Oil-Protein Diet also has a downside. As DrBudwig’s books are extremely difficult to understand and especially in non-German-speaking countries there are no translations of their works such as: “The fat syndrome”, more and more people believe that by reading a few lines, they can combine this knowledge with other existing information about diets. And so it is explainable, why there are now so many “experts” in Europe and America. But unfortunately, they’re not at all. Although you can easily learn about the oil protein as a user, it requires extreme specialist knowledge if you want to understand, change or compliment it. To make matters worse, there was only one company during DrBudwig’s time, who recommended them for products such as flaxseed oil, linomel, and coconut oil or flax seed. Today, there are countless companies that claim they produce oils for the Oil-Protein Diet like e.g. good flaxseed oil or other good. Unfortunately, these oils or products are often not too useable at all. Also in Germany, flaxseed oil is sold under the name Dr. Johanna Budwig, but this is after the IOPDF (International Oil-Protein Diet Foundation) guidelines with just a 3 star quality instead of a 5 – or 6-star quality as the diet calls for and the IOPDF recommends. So according to the label, the flaxseed is not from Europe and the flax- seed oil is not supplied in a continuous cold chain. Especially from a company in Germany, using the name Dr. Johanna Budwig, certainly many consumers expect the highest possible quality according to the guidelines of the IOPDF. Some patients do not even follow the Oil-Protein Diet, but another pseudo oil-protein-rich diet from the internet and think it’s as good as the Oil-Protein Diet, or even an “improved” Oil-Protein Diet. Others do not consistently apply the Oil-Protein Diet, but build up “their own Oil-Protein Diet”, for example without Sauerkraut juice. Many use simply inappropriate products because they hope that the flaxseed oil or cottage cheese mixed with yogurt that they buy would already suffice. And, increasingly, I unfortunately experience that patients make all three or at least two of the above-mentioned errors. The result is then logically what I often meet, namely an “Oil-Protein Diet” which does not work. Believe me, I would also prefer to be able to tell you something else, but unfortunately the success of the Oil-Protein Diet depends on the electron clouds and linolenic acid. If both are not in same size and quality, as required, the Oil-Protein Diet does not work, as Dr Budwig described. On the other hand, I always experience the fact that, the Oil-Protein Diet, when it is applied consistently, and with the right products, can produce almost incredible results, which many letters and thanksgiving letters always prove to me. In summary, I can say that the Oil-Protein Diet, even today, many years after DrBudwig’s death, is still a demonstrably successful nutritional therapy and for me still continues to be THE basic therapy of my 3E-Program. Cancer patients, with heart disease, diabetics, epileptics, manic-depressives, yes, probably every sick person, can benefit from it. Even though conventional medicine will always be against non-conventional treatments which is something that will certainly not change even in the 21st century. You need to ask no one what you must do to become healthy again. You need no permission for the Oil-Protein Diet, and this book is a gold treasure at your feet, thanks to Dr. Johanna Budwig. You need to pick it up. So it is up to you whether you bend down or not.